In essence, a craft and clothing company that enables relations among artisans, craftsmen and conscientious consumers. 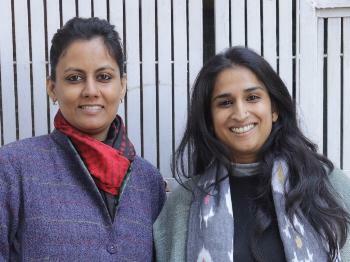 Jaya and Ruchi started Indigene in 2011 after several years of practice and research in crafts and handmade. Indigene collaborates with some of the finest artisans in several geographies, infusing their unmatched craft techniques into product development, reviving the simplicity and elegance of traditional clothing, to create accented handmade clothing. Indigene's products have a long yet conscious supply chain. Each handcrafted product is honed with care, is a life story in itself. A design company started by designers Ruchi and Jaya textile graduates from NIFT, Delhi. Indigene's design philosophy focuses on traditional handmade textiles - prints, weaves and embroideries and creates contemporary, wearable and comfortable clothing. Indigene works closely with artisans and artisan communities to give the traditional techniques a modern twist and create products that are affordable and appealing to today's woman. No refunds only exchanges possible within 2 days of receipt of the product in case of major defects like size, cuts, open seams or stains. We will appreciate if the exchange products are shipped back by the customer in the same condition as received. Kindly note our products are handmade (embroidered/ printed /natural dyed & woven). The slight imperfections in weaves or prints is a characteristic of handmade textile. Kindly do not look for a replacement for minor irregularities in prints or weaves. All our products carry a product tag which talks about the story behind the product and a wash care label for care instructions.